‘Keep Out The Foreigner!’ (Fallon’s advertisement, 1914) | Come Here To Me! 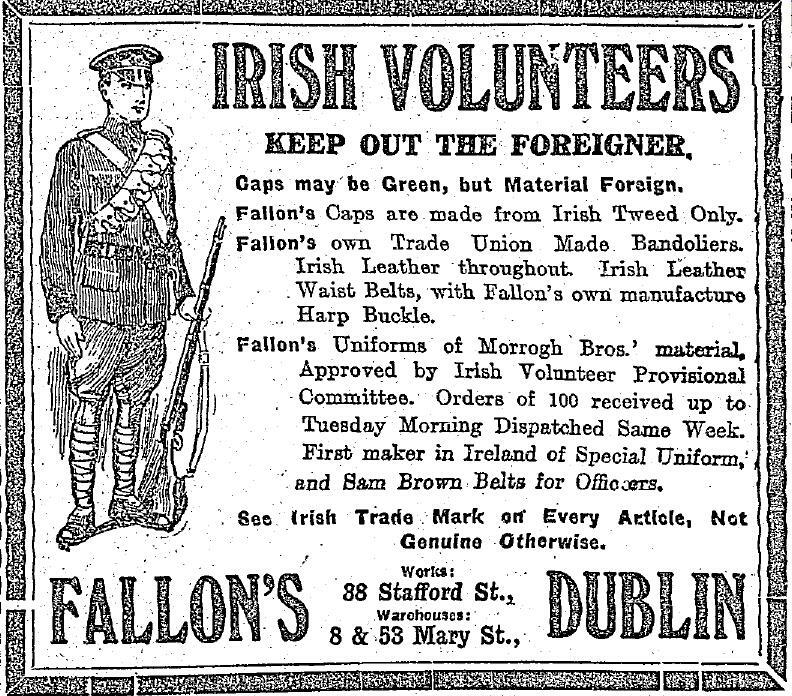 This advertisement from 1914 is interesting, promoting the Fallon’s company who produced uniforms for the Irish Volunteers. It encourages the reader to “Keep out the foreigner”, and interestingly it notes that the company use “trade union made” materials. By foreigner, the company are referring to non-Irish companies who produced uniforms. This advertisement appeared frequently in the Irish Independent, newspaper of William Martin Murphy who had led the employers offensive in 1913 against Jim Larkin and his trade union. There was a class element to volunteering (obviously). Officers often could afford better quality uniforms and equipment than rank and filers. There was a pecking order for weapons too. You needed cash to buy a Parabellum or a Smith and Wesson.